One of our gerbils is dead. We’ve been expecting it, as gerbils live between three to five years and ours are now over two years old. But I wasn’t really expecting what I would feel as I went over and saw his body all curled up in their nest, cool to the touch, and his whiskers stuck to the side of the cage. 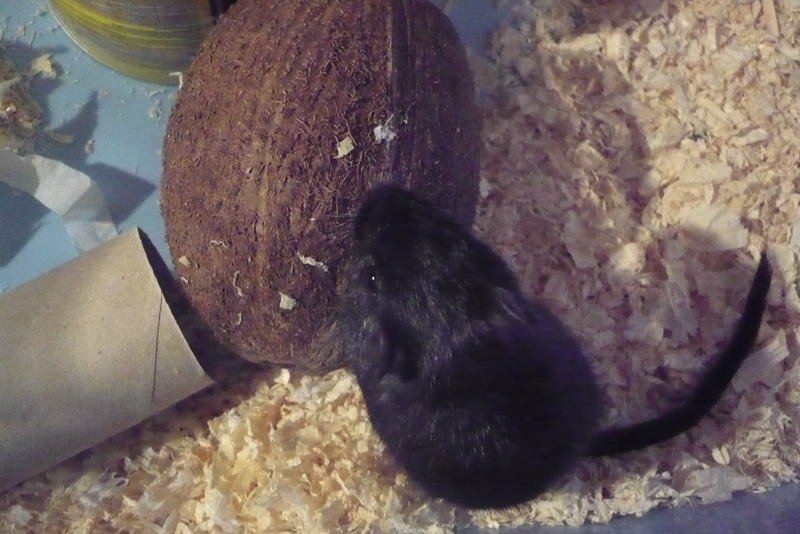 His brother was on the other side of the cage, as far as he could get from his brother’s corpse (I imagined) in the little coconut shell they use to play. Then I wanted to cry. They’ve become a part of our lives over their little one. Being played with by all the kids that come to our home, and generally just being there. Roz has gone from being absolutely terrified of them, to being their main carer, cleaning their cage, giving them food, getting them fresh water everyday, talking to them and playing with them a lot. I guess I feel guilty because, how long was Billie there with the corpse of his brother lying in the same cage? What was Ger’s life like? did he enjoy it?…about as much as you can, cooped up in a cage in a bigger cage with humans? Sigh. And I felt sad because now Billie will be all on his own. Gerbils live in groups of gerbils they already know, and to introduce a new, younger gerbil may mean a very grisly death for the newcomer…and even if they got along, Billie probably isn’t going to live much longer, then we’ll wake up one morning to another grim find. Roz was… about okay as a four year old is about death. Which is excited. She wanted to touch the body, she wanted to know why he was dead, would he come back, could we bury him in the cemetary where she had a walk with dad, and then if we went the next day, could we dig him up and he’d be okay? I think we coped okay. If anything, it was a good teaching point. Telling her that he was dead, and wouldn’t ever come back and that in the ground his little body would now help flowers grow. That yes, we were sad because he was gone now. That Billie was all alone and would need us to pay extra attention to him and play with him more because his brother was gone. She listened and nodded her head in all the right places, and played with him while I cleaned out the cage and put fresh bedding for poor little Billie. Farewell Ger, you’ll be missed. Poor little Ger. Our last picture of him. Oh poor Roz – this is so familiar and recent to me! I think we had very similar four year old reactions. A few months on sometimes I get asked if I’m still sad about Tyra and I say yes I am, but it doesn’t make me cry anymore, I just remember what a lovely cat she was and how nice and soft she was and what it was like to give her rubs and hear her purr. Then I get to ask if he’s still sad, and he agrees with my analysis. Really makes you feel like a grown up doesn’t it!? Ah Jill, I read your post and that was heartbreaking. You’re right, I really felt all of a sudden, very grown up about the whole thing and having to validate and teach Roz how to deal with her emotions while trying to model them myself was hard. Next story Look what I made! !